Microsoft System Center Suite: Configuration Manager 2012 - Let's start! Since I'm busy building a test lab, I thought I'd take the opportunity to blog some of the setup and findings as I go along. I'm starting with ConfigMgr 2012 in the lab and will be building it out with SCSM, SCOM, SCVMM etc as I go along. 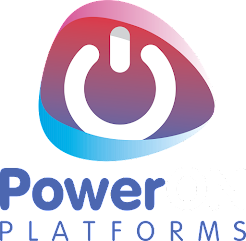 I'm not going to go into building the DC, except to say that I've created some standard service accounts for use with SCCM. Before installing in the lab environment, I used an internet connected machine to download the files that setup tries to download at run time. 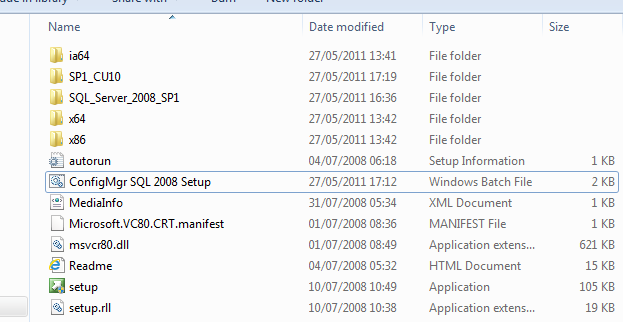 In ConfigMgr 2012, this is now a separate file called SetupDL.exe. Running this will prompt for where to store the files. Last time I ran it (07/06/2011) it gave me a total of 192Mb in 14 files. Now that I've got these, it's time to setup the server and install SQL. To make this work, extract the SP1 files to a folder called SQL_Server_2008_SP1 at the same root level as the SQL install files. 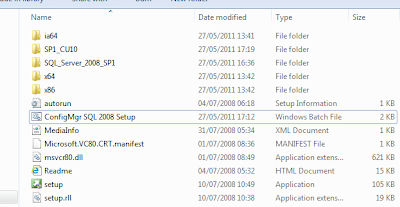 Also, extract the CU10 files to a folder called SP1_CU10 at the same level. N.B. I've used the %dp0 variable in the batch file so it doesn't matter where the source files or batch file is run from, as long as the batch file is run from the folder with the SQL files. To save the posts getting too long, I'll pop the SCCM 2012 install into a part 2 post. Thanks for part 1, but where do we find part2? Sorry, I actually forgot to even write part 2!! I'll try and get it done ASAP. lol. Looking forward to it. Thanks Steve!